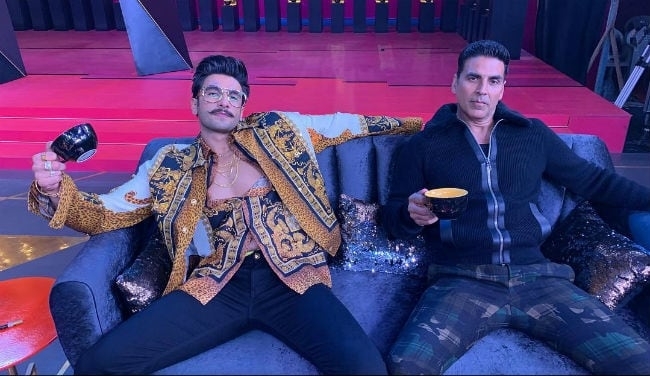 Ranveer Singh and Akshay Kumar made for an unexpected pair on this week’s couch, especially given that Ranveer’s more known to bring the house down with actors closer to his generation (Arjun Kapoor for one, while the episode with Ranbir Kapoor was a little mellow and a tad awkward given their past history). But all doubts were put entirely to rest when it was revealed that Ranveer was an all time Akshay fan, which was backed up not just with a cute throwback photo with the two actors while Akshay was shooting for the endlessly delayed dud Keemat way back in the late 90s, but also by Ranveer’s impressive knowledge of all the films released around that time, particularly the ones featuring Akshay in the lead. The actors between them had an easy, back-slapping camaraderie despite their incredibly contrasting personalities – Ranveer is tardy while Akshay, by his own admission, is a stickler for timing, and in parts, they were a complete riot – that impromptu scene where the two enacted a classic a 80s ‘badla’ scene was brilliant, especially considering it was done in the heat of the moment. Individually, Ranveer, despite looking ridiculously over the top in that Govinda meets Bappi Lahiri garb, was effortlessly self aware and self deprecating and his line: “Mundan hai, bachcha roh raha hai main naach raha hoon!” left me chuckling, more so, because I’m sure there’s some truth to it given his unending and unstoppable energy! In the same vein, his rapid fire too, was effortlessly quick-witted, and even though he played it safe with some of his answers, I’d pay good money for that Kuch Kuch Hota Hai remake with that exact cast, or that film with Taimur Ali Khan! Make it happen already KJo. Akshay on the other hand, was way more relaxed and at ease than he was with wife Twinkle Khanna in the last season – boys just wanna have fun after all, and they can’t really do that with the Mrs around can they? There’s a certain humility about Akshay which shines through – he doesn’t really have that “look at me I’m a star” aura about him – somewhere, somehow, you can tell that he’s very much in touch with who he is and where he came from, and that’s perhaps what makes him (and his recent performances) all the more relatable. He has that ‘common man’ persona which perhaps similar aged contemporaries lack, and that’s where he seems to have the edge. The interviews with his team were particularly endearing, and even they pointed out that they’re totally signed up to work with him for the long haul. The line that stood out the most was “He has the energy of a 12 year old in a candy store!” Akshay played it safe with his answers again especially during the rapid fire round, but unlike Ranveer didn’t sit on the fence as much which is what ultimately led to the round being a tie between the two. While the two actors were entirely engaging and watchable, host KJo needs to mix it up a little – the humour and cattiness at times seem a little forced, and even the questions themselves seem to have completely lost their edge – a key point that made previous seasons so watchable and gave us tidbits to chew on for months after! The bonus game at the end, yet again proved to be the most entertaining – I found it ridiculous that neither of the two could guess three films that SRK-Kajol had featured in, or the fact that Mohra completely went over Akshay’s head. Side note: I found it endearing when Akshay was letting Ranveer get ahead in the game, without whining like a baby – he clearly realises that he ain’t gonna lose any sleep whether he wins or loses so he got a few brownie points on that front, and of course his re-enactment of Madhuri’s ‘Dola Re Dola’ was totally priceless, so there was that. This week’s episode upped the ante a little especially after the tepid opener we got last week – it’s unlikely that Aamir Khan (who’s the guest next week), will be able to match the energy of this week’s show, especially given his diplomatic reputation and given that we know that it’s no co-incidence his show is airing during the exact same week that he has a big ticket release coming up (Thugs Of Hindostan, for the uninformed). Anyway. We digress. 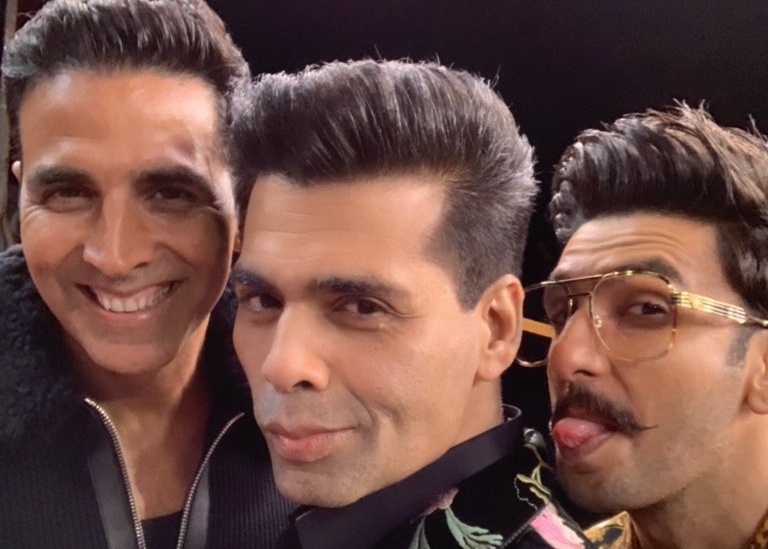 Ranveer-Akshay both as a duo and individually were enjoyable but the show ended a little abruptly and they needed a little more airtime to show a little more madness. That said, KWK Season 6 is heating up alright, but I’m still not entirely sold as to whether it will give us as much to chew on as previous seasons have. One can but hope though.